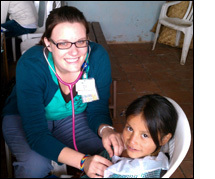 I recently returned from an amazing trip to Ecuador to participate in the Shoulder to Shoulder May Medical Brigade. My primary purpose as a pediatrics resident was to provide acute care for children in multiple different rural, under-served, and isolated areas of Ecuador surrounding Santo Domingo and Cotacachi. I treated many children with different illnesses primarily including parasitosis, anemia, pneumonia, upper respiratory infections, urinary tract infections, and multiple other types of skin infections, to name a few. Additionally, along with a group of other pediatrics residents, I helped to lead a neonatal resuscitation training workshop for about thirty pediatricians and pediatrics residents in Santo Domingo. In addition to having the opportunity to examine and treat many patients, I also had the opportunity to interact with the community. I was able to learn from and participate in the local traditions and to even interact with a shaman of one of the indigenous communities. In total, our team of pediatricians, internists, family physicians, nurses, physical therapists, dentists, and pharmacists were able to examine and treat close to one thousand patients during our brigade. It was both a humbling and an enlightening experience that I will carry with me throughout my continued training and practice of medicine and hopefully will be the first of many such opportunities in my medical career.